5 Bdrm Detached Dwellhouse. Ground flr: V/bule. Reception hall. 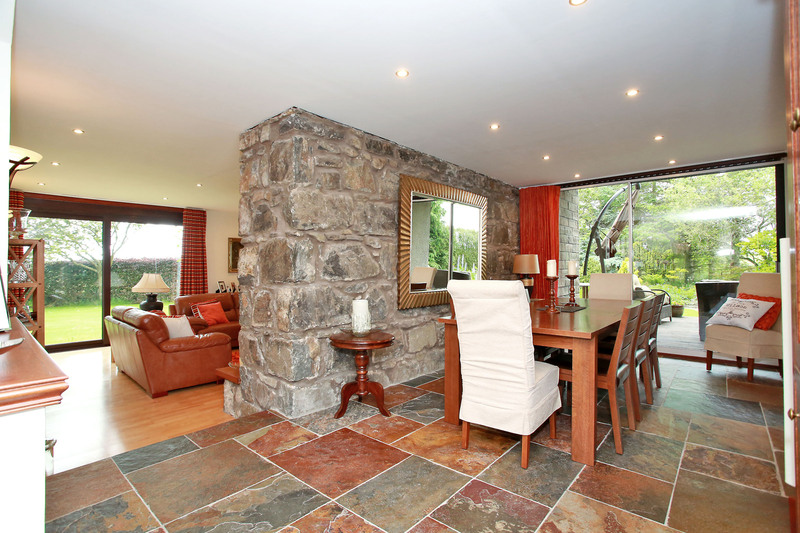 Dining rm. 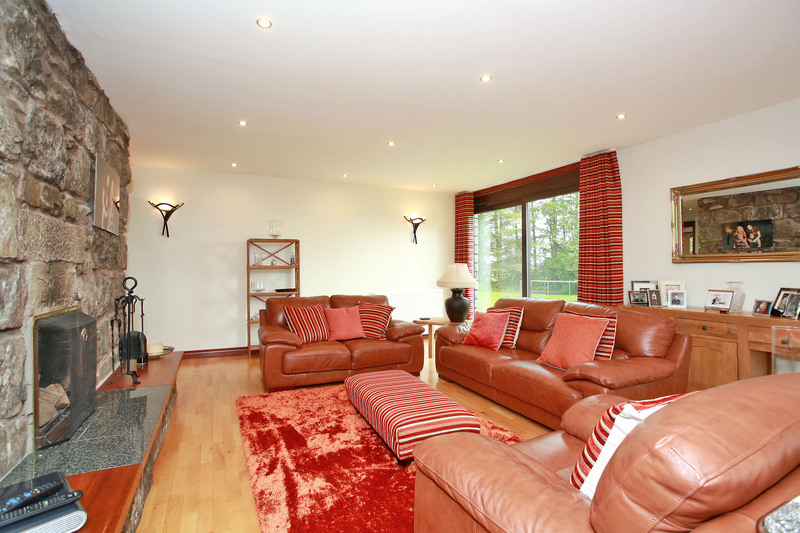 Family rm. Dining kitch. Utility rm. 4 Bdrms. 1 with ensuite. Bathrm. 1st flr: Lounge. Bdrm with ensuite (CT band - G). Garden. Double Garage. Parking. 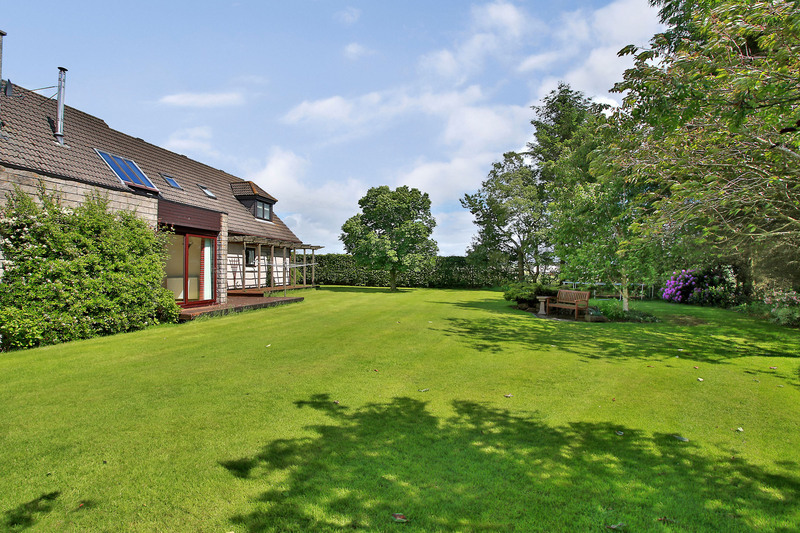 Price over £595,000 Entry by arr. Viewing 01651 882732 or contact solicitors. (EPC band - D). 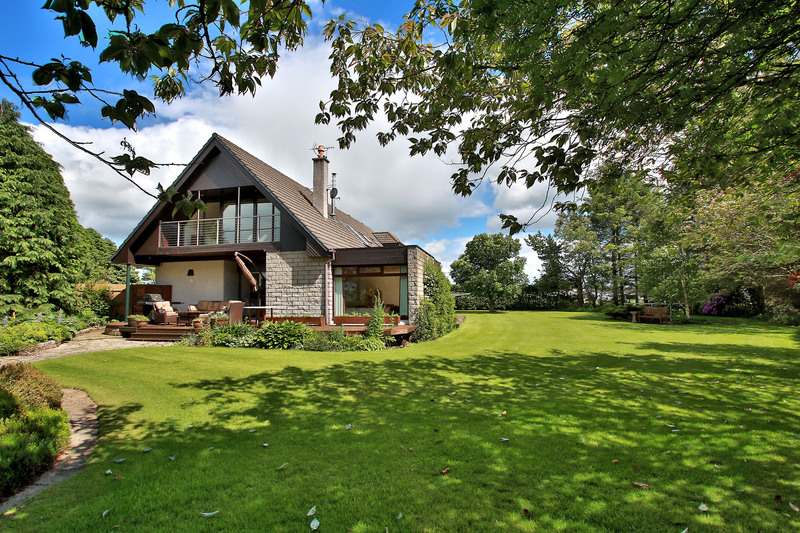 This stunning 5 bedroomed detached family home has been individually designed and is situated in the lovely rural hamlet of Kinmuck. 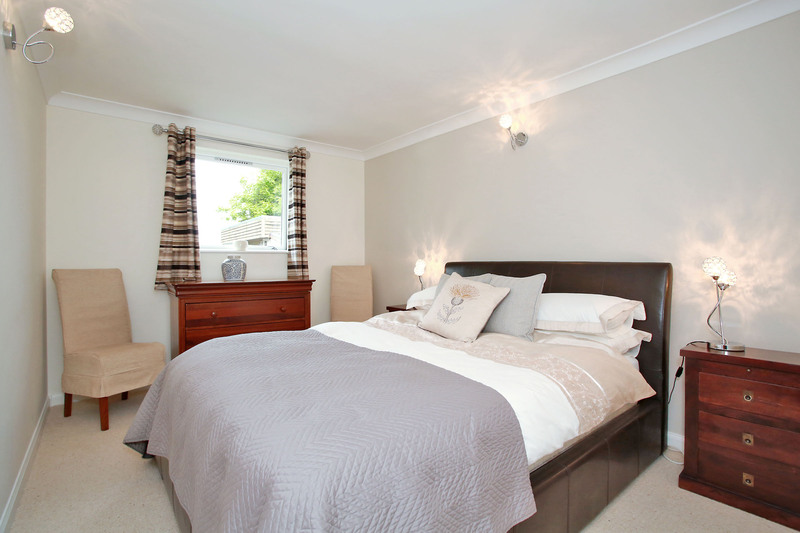 The property has been decorated tastefully and neutrally and has spacious living and bedroom accommodation throughout. 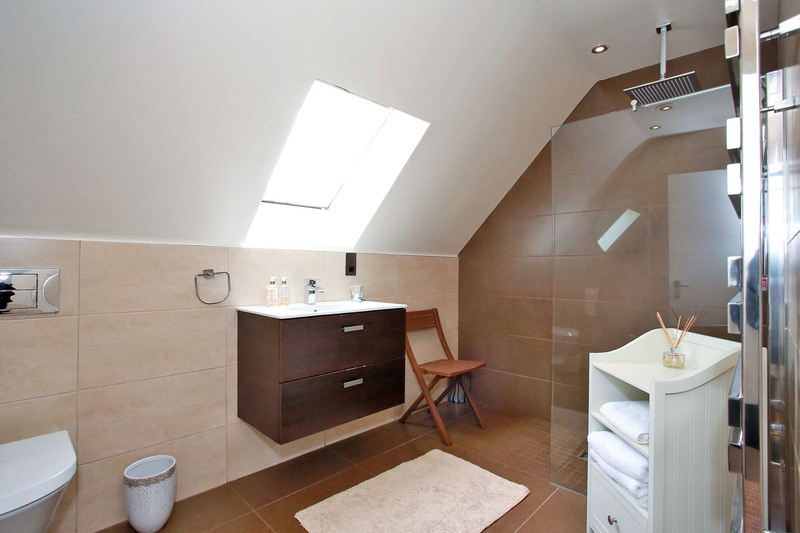 Recently modernised two new bathrooms and kitchen/utility rooms which has been fitted to a very high standard. 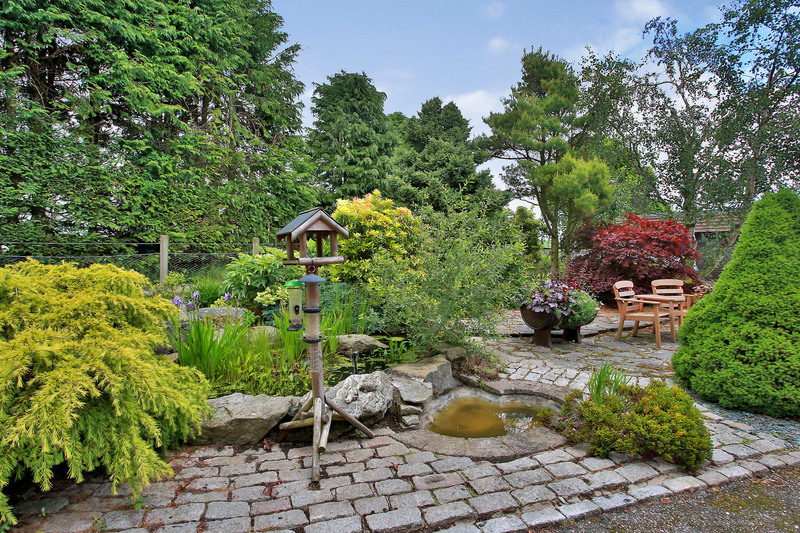 Fridayhill benefits from oil central heating and full double glazing, it has a large detached double garage and extensive landscaped garden grounds extending to approximately 0.5 acres. 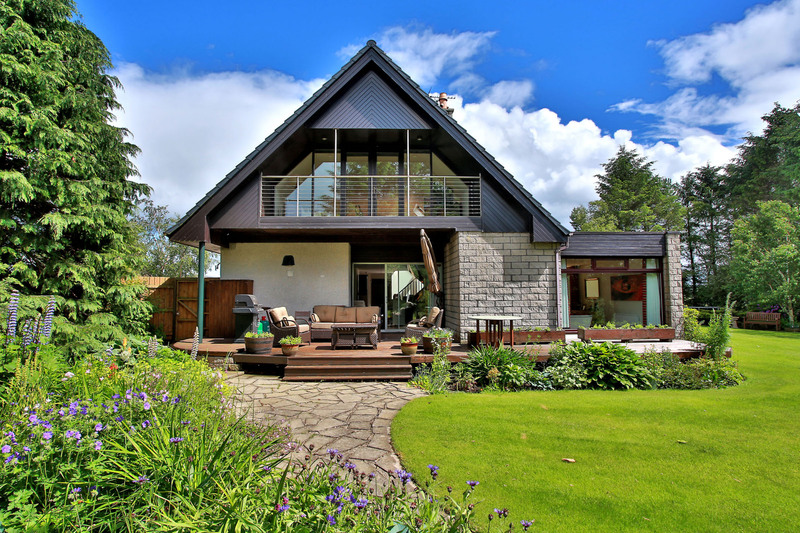 The property really has to be seen to appreciate all it has to offer. 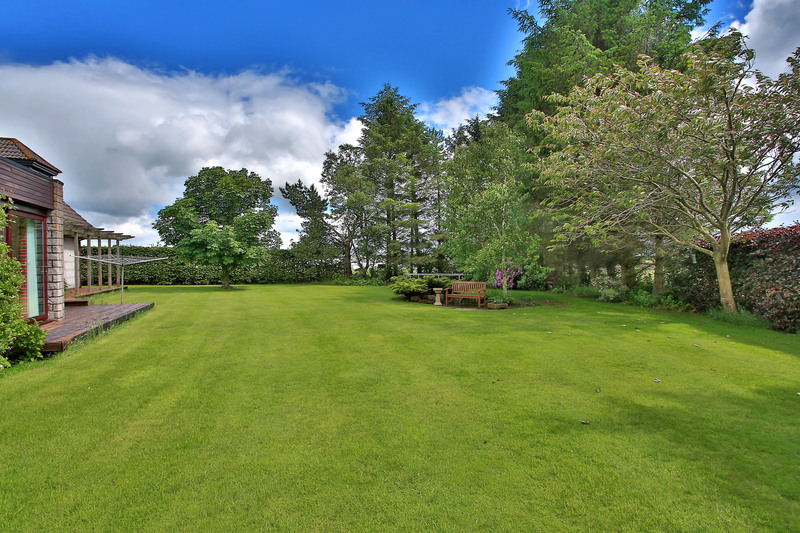 Location: Kinmuck is a charming country village situated to the north west of Aberdeen and approximately 4 miles from the bustling town of Inverurie with a large range of services and amenities. Local Primary schools include Keithhall and Hatton of Fintray and Secondary schools include Inverurie Academy and Oldmeldrum Academy. The airport and Dyce are only 9 miles away with excellent road and rail links into the city of Aberdeen. Directions: From Inverurie High Street take the road for Keithhall. Continue through Keithhall passing the School on the left, continue up the hill a short distance and you will see the sign for Kinmuck, turn right and continue into the Village of Kinmuck. Continue through the Village passing the Boars Head on the left, take the next road on the left signposted “Fawells”. Continue along this road for approx. 1/3 mile and the road takes a sharp left, there is a private road to the right on the bend and this will be identified by a Peterkins For Sale Sign. “Fridayhill” is the first house on the right. Entrance Vestibule: Solid wooden door with glazed panels at each side lead into the spacious vestibule; beautiful slate floor; glazed door with side lights lead into the reception hallway. 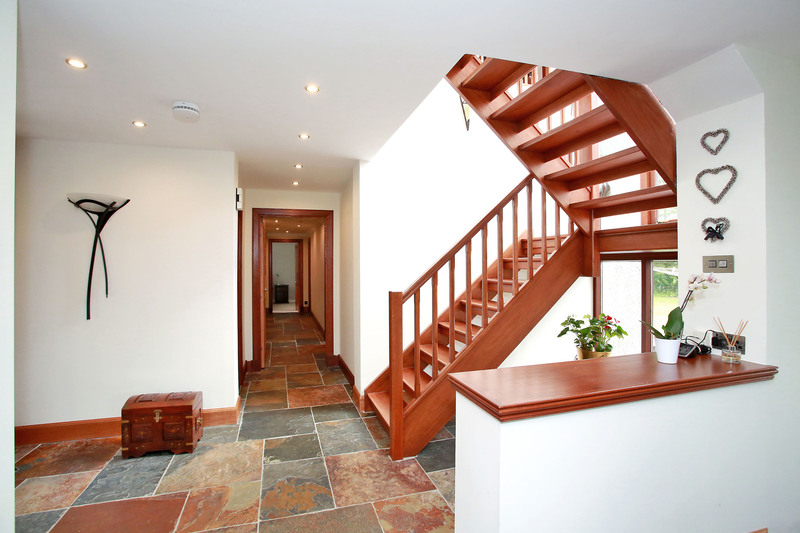 Reception Hallway: A spacious and welcoming hallway with impressive open wooden staircase leading to the upper floor with a stunning feature full length windows overlooking the South facing garden grounds; slate floor continues through the hallway and into the open plan dining room; exposed granite walls gives the house an unique mix of contemporary modern and locally sourced granite stone; steps lead down into the family room; door to the inner hallway and dining kitchen; door to the boot room, walk in with carpet, light, coat hooks and built in storage cupboard at the rear; down lighters. Dining room: 18’8” x 10’8” (5.68m x 3.25m) Open plan to the hallway and steps lead down to the family room this is a lovely open space but still has a warm feel with the exposed granite wall; large patio doors at the end of the room give access to the decked patio; down lighters; slate floor; door to the dining kitchen. 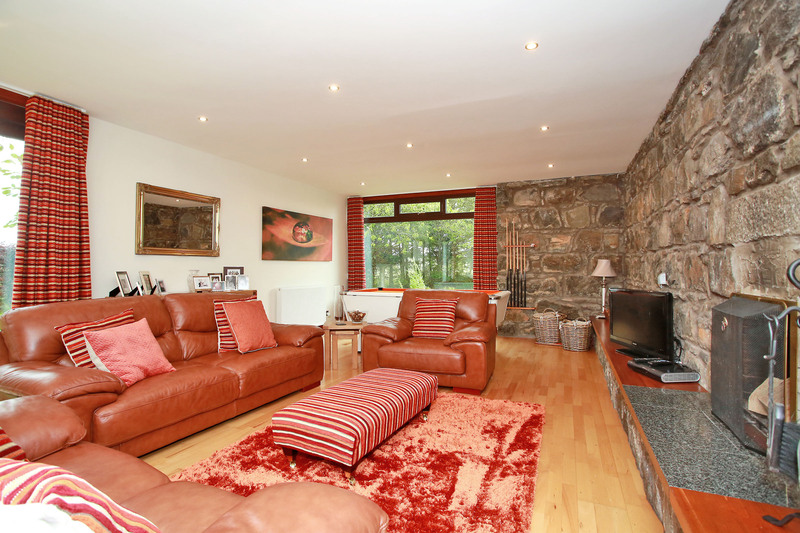 Family Room: 26’6” x 16’0” (8.07m x 4.87m) An extremely spacious room to the rear of the property with patio doors leading onto the garden grounds and a further picture window to the side of the property giving lots of natural light to the room; exposed granite wall incorporating an open fire; solid beech flooring. 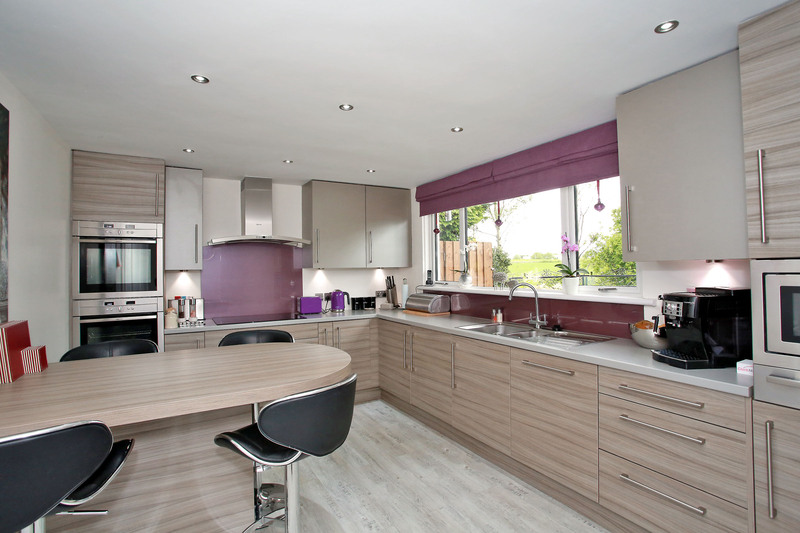 Dining Kitchen: 14’5” x 10’8” (4.39m x 3.25m) A lovely bright and spacious dining kitchen which has recently been fitted with modern base, drawer and wall units with co-ordinating worktop and coloured glass splashback; integrated “Neff” two single eye level ovens with two warming drawers; “Neff” integrated eye level microwave and dishwasher; “Neff” ceramic 5 burner hob and extractor chimney style hood; stainless steel 1 ½ bowl sink with waste disposal unit, drainer and mixer tap; breakfast bar/seating area; under cupboard down lights; ceiling down lighters; feature radiator; window to front; wood effect flooring. Utility Room: Fitted with modern base, wall, drawer and larder style units with co-ordinating worktop and stainless steel sink, drainer and taps; built in storage cupboard with hot water tank; American style fridge/freezer, washing machine and tumble dryer will remain; light fitment; window to the front; wood effect flooring. Inner Hallway: The inner hallway gives access to 4 double bedroom, one with en-suite and family bathroom; slate floor; down lighters. Family Bathroom: A lovely spacious family bathroom which has recently been fitted to a very high specification incorporating a three piece suite comprising of corner bath, modern rectangular vanity wall hung sink with 2 drawers, concealed cistern WC with storage either side; further large shower area with glass panels, mains fed shower, rainfall shower head and further removable shower attachments; fully tiled walls and tiled floor; down lighters; extractor fan; ladder style radiator; underfloor heating; window to the front; roman blind. Bedroom: 13’5” x 9’11” (4.08m x 3.02m) A good sized double bedroom with window to the front of the property; roman blind; down lighters; television point; carpet. Bedroom: 13’5” x 9’4” (4.08m x 2.84m) Another good sized double bedroom with window to the front of the property; curtains; wall lights; television point; carpet. 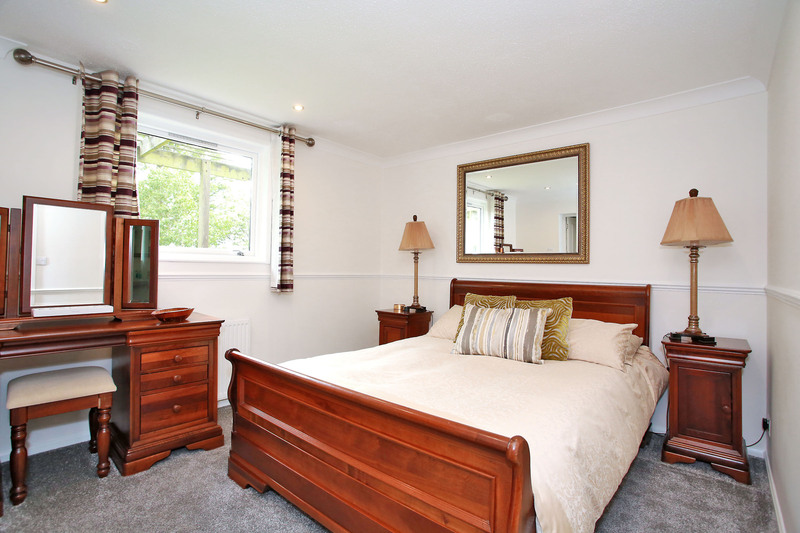 Guest Bedroom: 11’11” x 10’5” (3.63m x 3.17m) A lovely double bedroom with window overlooking the garden grounds; curtains; down lighters; carpet; door to en-suite. 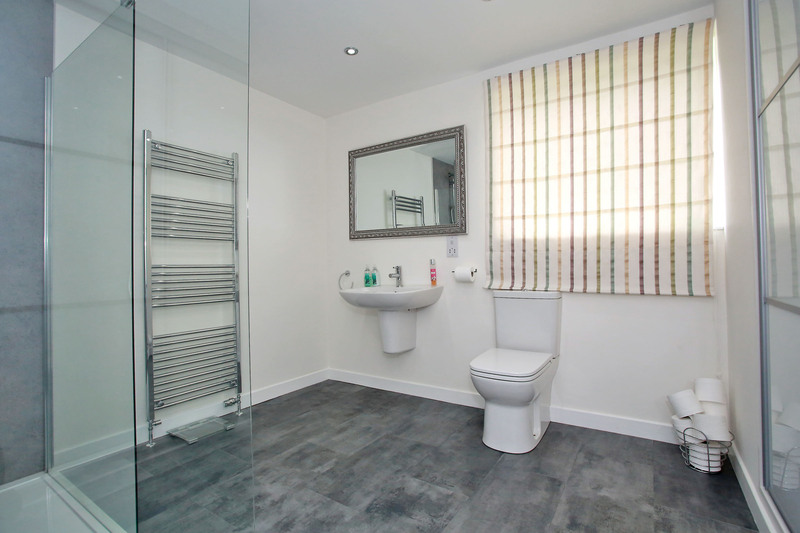 En-Suite: 9’9” x 8’11 (2.97m x 2.71m) An extremely spacious room with window to the side of the property; roman blind; fitted with an extra large shower with glass screen; mains fed shower and aqua panelling; wall hung wash hand basin and WC; down lighters; extractor fan; shaver point; large built in cupboard with hanging and shelving and sliding rooms; ladder style radiator; tile effect flooring. 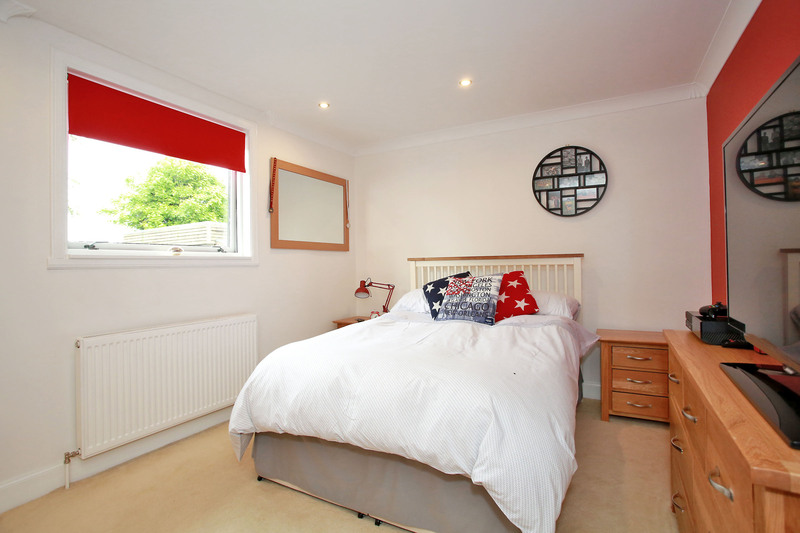 Bedroom: 12’6” x 10’5” (3.81m x 3.17m) A bright and spacious double bedroom with window to the rear of the property; curtains; down lighters; television point; carpet. 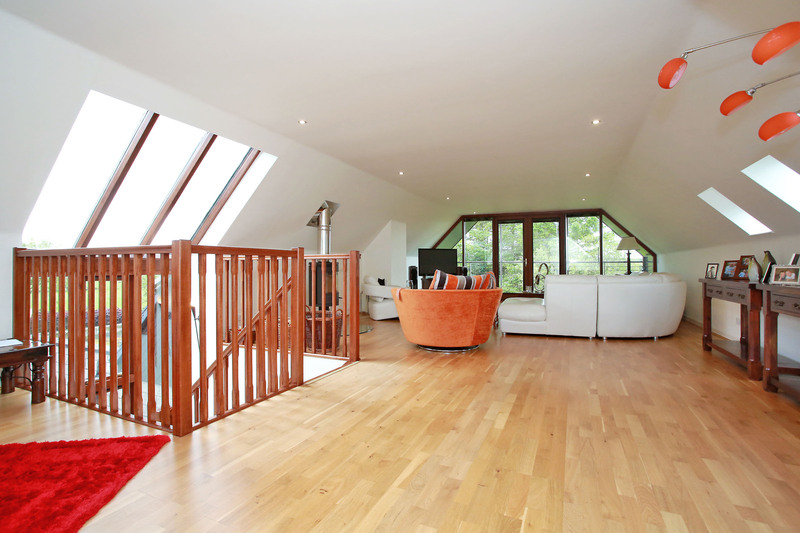 Stairs to Upper Floor: Open wooden staircase with feature full length window overlooking the garden grounds leads to the upper floor; open plan into the stunning Lounge with balcony; study area and door leading to the Master bedroom suite. 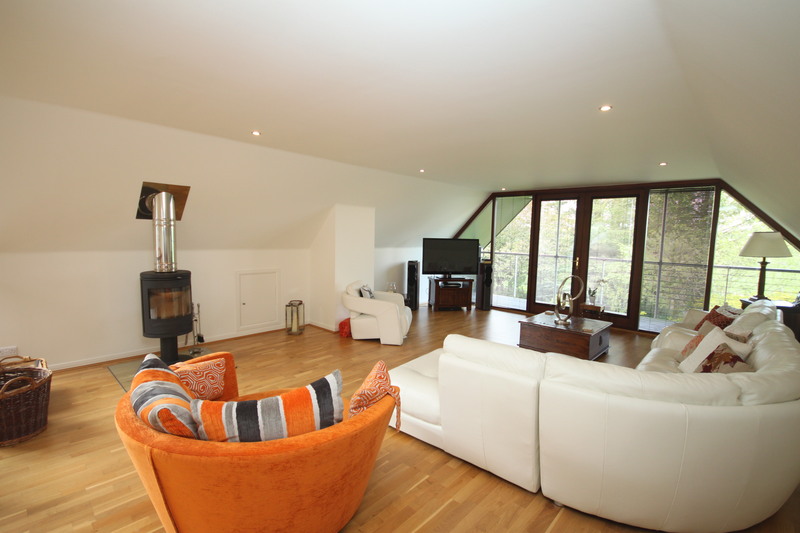 Lounge: 38’10” x 19’4” (11.83m x 5.89m) An absolutely stunning room with large gable end feature balcony; full wall to wall windows with french doors flood the room with light and give access to the balcony; the balcony boasts stunning open views to the West and the surrounding countryside; decked and fitted with stainless steel handrails; the Lounge has a Morso wood burning stove set on glass hearth which is a lovely feature to the room; Velux windows to both the front and rear; down lighters; television point; STUDY AREA with Velux window; built in storage cupboard; access hatch to loft; smoke detector; down lighters; telephone point. 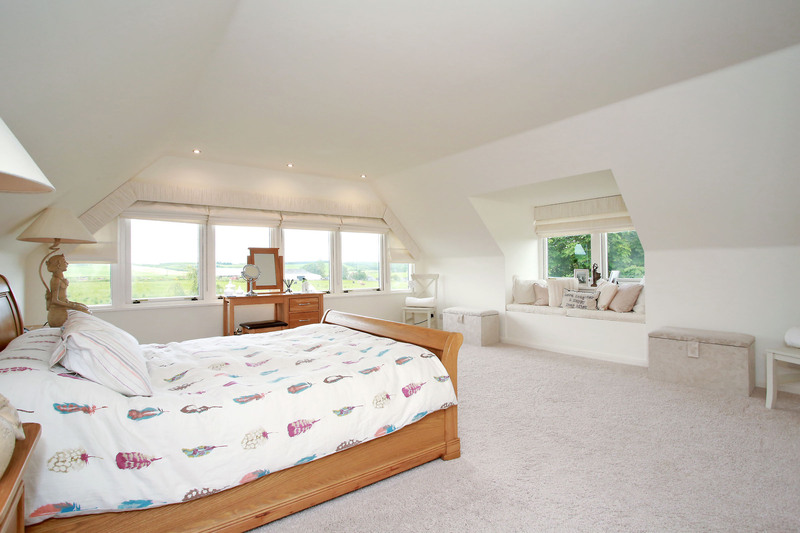 Master Bedroom Suite: 27’2” x 16’9” (8.28m x 5.10m) A stunning and extremely spacious room with open views over the surrounding countryside to the East; the gable end boasts windows the whole width of the room and into the apex of the roof making the most of the stunning views; beautiful roman blinds with matching pelmet frames the picture windows; further window to the rear of the property with window seat to enjoy the views of the garden grounds and beyond; matching blind and pelmet; wall of built in wardrobes with hanging rails and shelving; carpet; door to en-suite shower room. 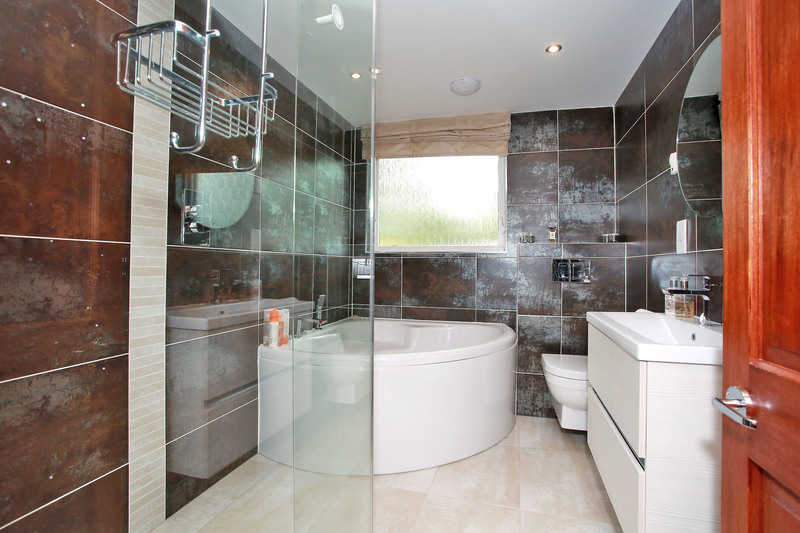 En-Suite: Fitted with a two piece suite comprising wall hung vanity sink with storage drawers and concealed cistern toilet; separate large shower area with glass screen and mains fed shower; tiled floor and walls; ladder style radiator; down lighters and extractor fan. 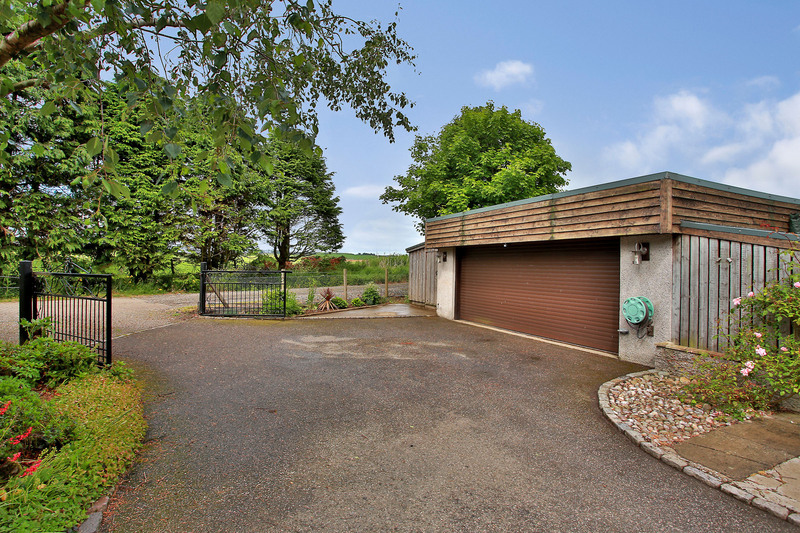 Outside: The sweeping tarred driveway has both entrance and exit gates and provides parking for several cars and also leads to the LARGE DETACHED DOUBLE GARAGE; fitted with remote controlled roller door, power and light, also fitted with workbench and plenty of storage cupboards; wooden shed to the side of the garage and further wooden log store will remain; the garden grounds that surround the property are extremely well maintained with large area of lawn and an abundance of mature trees, shrubs and planting; large decked patio area to the side of the property of the property which can be access from the dining room and makes an ideal BBQ entertaining area; further decked patio area to the south rear garden with pergola and accessed from the Family room; this stunning garden grounds area extremely private and extend to approximately ½ acre. Additional Information: the property benefits from oil fired central heating; double glazing; mains water and electricity; the property also has a 6 camera security system, digital and satellite connectivity for “sky” reception and usb hubs integral with the power sockets in all bedrooms; all carpet, blinds, curtains, white goods and light fitments will remain.